Nanoscience as a field of study is rapidly changing, despite only being around since the mid to late-twentieth century. But, as scientists and engineers have been working on their ultra-small scale matter, nature has been perfecting nanomaterials over the millennia. A new focus is drawn to bio-inspired nanomaterials and has produced applications towards medicine, molecular detection, and drug delivery systems. One of the more recent bio-inspired materials is based on the nanostructures of the Green Hairstreak (Callophrys rubi) butterfly. Researchers from the Swinburne University of Technology, Australia developed artificial materials with unique optical properties based on the wings of this butterfly. With this new discovery, the researchers report a technique that could be used to make screens on electronics more brilliant. The scales on the underside of the Green Hairstreak’s wings have an iridescent quality that attracted the team to investigate closely. Scanning electron microscopy gave a high-magnification view of gyroid nanostructures. The structures resemble a three-dimensional lattice with regular, geometrically symmetric channels or pores. The unit cell, the smallest repeatable portion of the lattice, was between 310 and 350 nm, with features at 90 nm in size. To replicate the features, the team used a two-beam super-resolution lithography technique to generate a 360 nm lattice. With this system, the researchers could design a lattice as small as 300 nm. A single beam technique limits the resolution of fabrication at the lower limits. The light will begin to diffract around 100 nm, but by using a second inhibition beam, the diffraction of light is decreased, making a finer beam with resolutions down to 9 nm. The researchers shared that the new fabrication method had marked advances compared to the natural gyroid structures. The lattice had uniform size and dimension unlike the variable natural ones and the orientation of the lattice was well-defined. This is compared to the butterfly wings which contain, at times, a mix of left- and right-handed gyroid enantiomers (think clockwise or counter-clockwise twists). The team notes that the gyroid structures have been fabricated before, but not to the size seen here. These artificially fabricated structures have very desirable photonic properties. As mentioned before, the wings of the butterfly are slightly iridescent, but the natural structures in the wings will often have anomalies within the gyroid lattice. 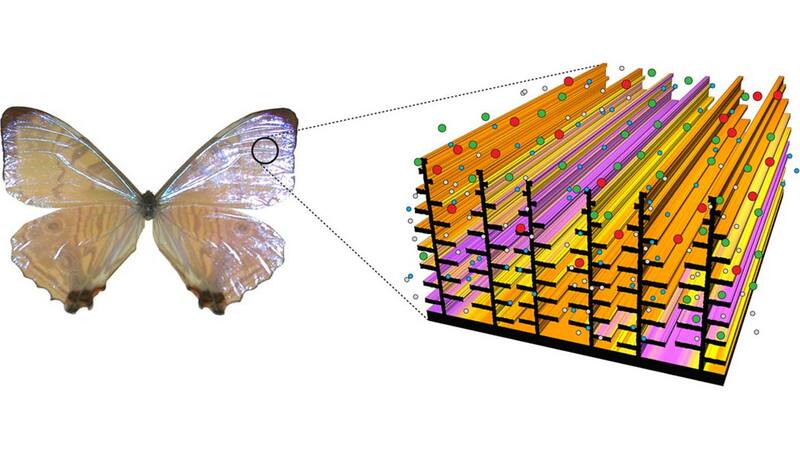 By removing these anomalies, the synthetic material can interact with plane polarized light in unique ways; something the butterfly wings cannot do. By altering the unit cell, say 300 nm to 360 nm, the materials can shift their absorption spectra, which changes the colors from blue to blue-green. Another advantage of having a well-ordered material is the improved mechanical strength. The team generated materials using conventional single beam printing and two-beam lithography. The materials were then subjected to atomic force microscopy experiments to determine their strengths. What they found was that the two-beam system produced a stronger material. The two-beam system was approximately 40% stronger than the single beam system. The authors describe that a two-beam, 130 nm linewidth was roughly equivalent to a 185 nm single-beam linewidth material. With the improved optical properties and mechanical strength, the researchers are excited to apply their materials to many existing technologies. The team envisions using the fabrication process to produce smaller, compact screens that are more energy efficient without suffering a loss in brightness. The problem with making devices more compact is that it usually comes with a loss in durability. With the method developed here, the added mechanical strength would make the screens more durable for everyday use. Top image: Representation of the chitin nanostructure seen in butterfly wings. Copyright Radislav A. Potyrailo.